There's never been a more perfect time than now for the re-emergence of one of the most requested albums at virtually every reissue label. 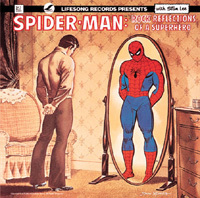 Originally released 25 years ago, Lifesong Records teamed with Marvel® Comics for a critically-acclaimed and very musical LP that explored the life of America's favorite superhero, Spider-Man®. Scoff if you must, but it wasn't just kid stuff! Any 8 to 18 year-old fanboy worth his weight in webbing agreed it was one of the coolest records in their collection, and college radio was all over its myriad of musical styles that included pop, rock, reggae, swing and doo-wop. It retold the origin of Spider-Man®, his encounters with Dr. Octopus® and The Green Goblin®, and his romance with girlfriend Gwen Stacey® with narration by Marvel®'s own Stan Lee, cover artwork by famed Spidey-artist John Romita and a musical bed that included the likes of Rolling Stone Magazine darlings Crack The Sky, and super-saxophonist David Sanborn. As a special treat to fans, NO ONE'S GOT A CRUSH ON PETER has been restored to full track status from its original use as incidental music. What a bargain! But wait, it gets better...also added is the closing narration by Lee. Excelsior! For anyone who grew up watching the original cartoons of the '60s, owned this album in the '70s, read the comics through the '80s, watched the '90s animated upgrade, or are kids of the new Millennium, this CD becomes the perfect souvenir of a childhood that, for many, will continue as long as there's a friendly neighborhood Spider-Man®! We all know about the radioactive spider that bit Peter Parker® and turned him into Spider-Man®, so we won't go into that here. A Marvel® Comics exec saw Spider-Man®'s musical potential and sold Lifesong Records' Terry Cashman, Tommy West (both Jim Croce's producers and the vocal duo Cashman & West) and Phil Kurnit on the merits of a pop-rock approach to the superhero. The label's own highly creative roster of producers, recording artists and songwriters immediately pitched-in, including jingle singer Marty Nelson whose vocals were on almost every other commercial in the '70s. Nelson became the singing voice for Spider-Man®, and was able to handle the psuedo-rock opera's vocal demands as well as co-produce the ambitious project. The icing on the cake was narration by comicdom's crowned king, Stan Lee. Since the day it was taken out of circulation, the album has become a valued collector's item that reportedly has sold for $500 on eBay this past year.